4 Ways to Use Your Intimidator Side-By-Side | Intimidator Inc. When most people think of side-by-sides and utility vehicles, they often think of heading down rocky terrain, exploring unknown and hard to reach locations, and racing against friends to see who will get to the finish line first. While UTVs are definitely a way to break the boredom and explore, there are also several other practical ways to use a side-by-side UTV. Here are 4 ways that an Intimidator UTV can improve situations and overall efficiency. From local community events to large televised events, having the power of a utility vehicle can really help with making an event run smoothly. Side-by-side vehicles like the Intimidator Crew Cab Series are a great option to transport people from parking lots to events, get the entertainment safely to and from the stage, and help crews set up and take down booths and other event props. The Intimidator Crew Cab is a great choice for those who host events on a regular basis. This SXS can seat up to six adults comfortably. It also has a full-size bed that holds up to 1,000 lbs which makes it easy to haul loads back and forth with a full crew. Side-by-side UTVs are also great for security and medical teams at events. Unlike a golf cart, UTVs can move through tough and uneven terrain and can also move a lot faster in order to get security and paramedics where they are needed. From college campuses to large hospitals, maintenance teams are what keep buildings functioning across the United States each day. With the help of UTVs, jobs such as replacing site-wide broken fixtures, hauling large items from one destination to another, and landscaping are a little easier. And for maintenance crews that require a truck bed to haul various loads, the Intimidator Truck Series is the perfect vehicle to make the tough jobs easier. The Truck Series has a 6-foot truck bed with foldable sides that easily convert the truck bed into a flatbed if needed. It also includes passenger side and driver side storage boxes to house additional tools and equipment. When your business or industry takes up a lot of square footage, it’s necessary to have a way for managers, supervisors, and other employees to get around. Side-by-side UTVs like the Intimidator Classic Series are great additions to any workforce. They provide the transportation you need and the power to handle multiple passengers and cargo. Worried about the noise? With the Intimidator Classic Series UTV, you get a few different options to choose from when picking your power including a 48-volt Brushless Electric engine. Don’t let the word “electric” fool you. This electric engine offers 120 lbs of peak torque. Many avid hunters already enjoy using utility vehicles when it comes to their favorite sport. 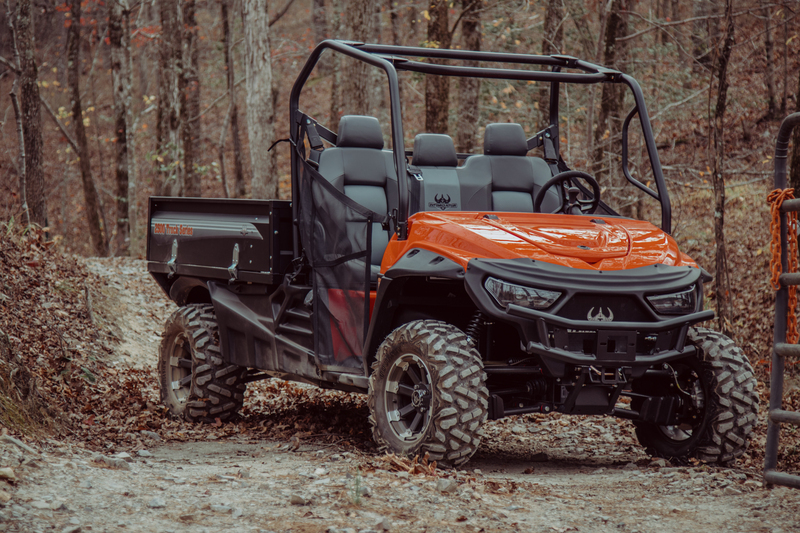 Not only do UTVs make it easy to go deep into the woods in order to set up better camps and places to hunt, but these rides also allow you to load up your trophy kill and get it home with ease. Depending on what you hunt and where you hunt will help you determine what kind of utility vehicle you need. If you prefer a ride that is quiet but powerful, you may want to look into our electric UTV, the Intimidator Classic mentioned above. This 3-seater UTV can hold up to 1,200 lbs of cargo. However, if you enjoy getting off-trail or need to go a bit deeper into the woods, then check out the Intimidator Enforcer ATV Series. This is one ride that can get you where you want to go. Power-steering, portal rig 4” gear lift, 18” ground clearance, and more make this one tough machine. And when you upgrade to the Realtree Camo option, you will be ready to rock and roll on your next big hunt. 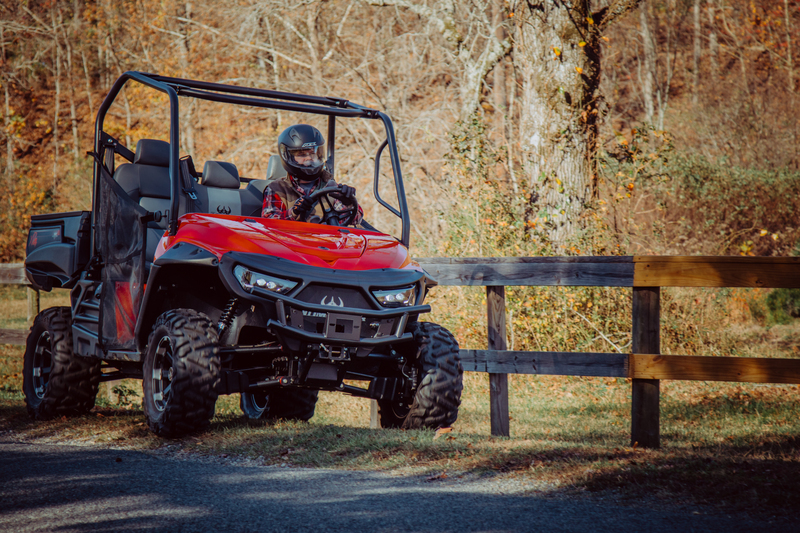 All Intimidator UTVs are designed to WORK, HUNT, and PLAY. Fly down back roads and trails on the weekend with friends and haul tools and equipment to your job site during the week. Want to learn more about Intimidators? Our website is packed with photos, videos, 360 views, and specs for each vehicle. You can even BUILD YOUR OWN INTIMIDATOR using our custom feature. Need more? Use our DEALER LOCATOR to find an Intimidator UTV Dealer near you. Give them a call, or better yet, go for a visit and check out these rides in person.